The Chronicles of Narnia : The Lion, The Witch and The Wardrobe was the first book by C.S.Lewis that i have read. It was a bit like a children’s fairy tale with witches, centaurs, different animals (The Lion as the King) and heroic children. And it is a very good book. Discovering the wonderful world of Narnia helped me discover C.S. Lewis as a writer and knowing he is a believer in Christ was a plus point(ha!). My sister borrowed a very old edition of C.S. 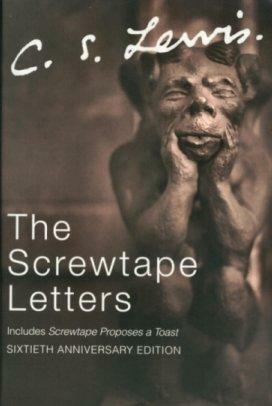 Lewis’ Screwtape Letters. It is not much a story book. It is a bunch (31) of letters from an affectionate uncle to his nephew discussing tactics, disappointments and temptations not for them but from them. Screwtape (the uncle) and Wormwood (the nephew) are followers and worshippers of Their Father Below (Satan). Each of them has a patient, and a mission to win them over to the other side. Unlike The Chronicles of Narnia, this book is not for the faint of heart. This shows how devious devils could be and how man unknowingly doing things dictated by the evil ones. The fun part is, in the letters (as far as i have read) you can see how great a liar a devil could be. It also shows how inconsistent they could be becasue of thinking too much of tactics to defeat their Enemy (Our Lord). I haven’t finished the book.. so technically, this is not a review. haha. If you are strong enough, i encourage you to read The Screwtape Letters. It is very Heavy(?) 160 pages but it is worth it. Anyway, that book was dedicated to his bestfriend J.R.R. Tolkien.